A developing storm in the Southwest brought another round of snow to the Four Corners on New Year’s Day, including almost 3 feet of snow in the mountains north of Albuquerque. 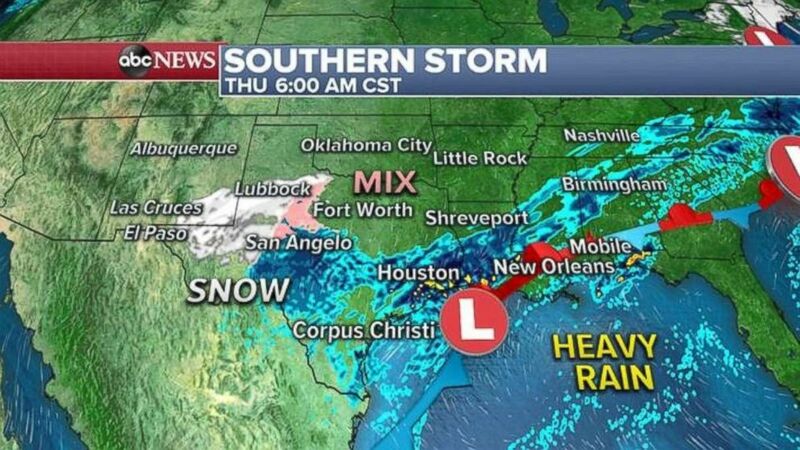 The storm will interact with a low in the Gulf Of Mexico and bring snow, freezing rain, sleet and flooding in the southern U.S. through Friday. 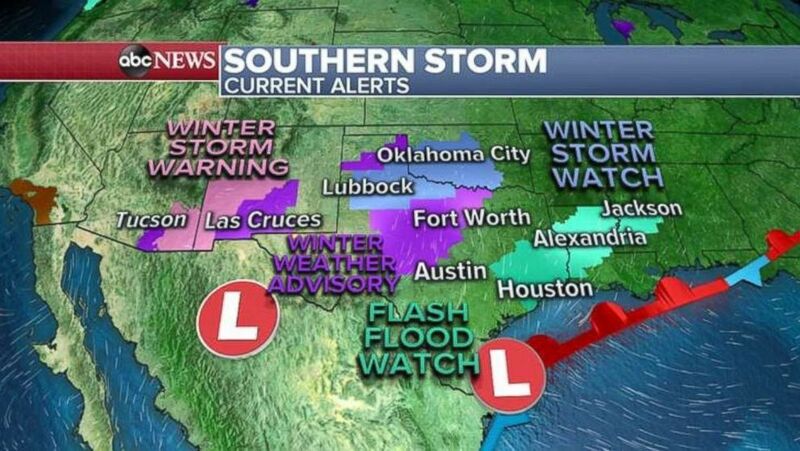 Winter storm warnings, winter weather advisories, flash flood watches and winter storm watches are in effect for parts of the southern U.S. from Arizona to Mississippi. Storm alerts cover most of the southern U.S. on Wednesday due to two storms moving through the region. Temperatures are at or just below freezing in central Texas, which could make for slick spots Wednesday morning if rains freezes on contact with the ground. Travel between Abilene and Fort Worth could be treacherous in spots on Wednesday morning. An icy mix is possible from San Angelo to Fort Worth during the day Wednesday, while snow moves from Tucson to El Paso. On the warmer side of the systems, heavy rain will move along a stationary front from Corpus Christi to Birmingham, Alabama. Locally heavy downpours are possible in central and southern Louisiana, as well as southeast Texas. Flash flooding is also possible in this region. 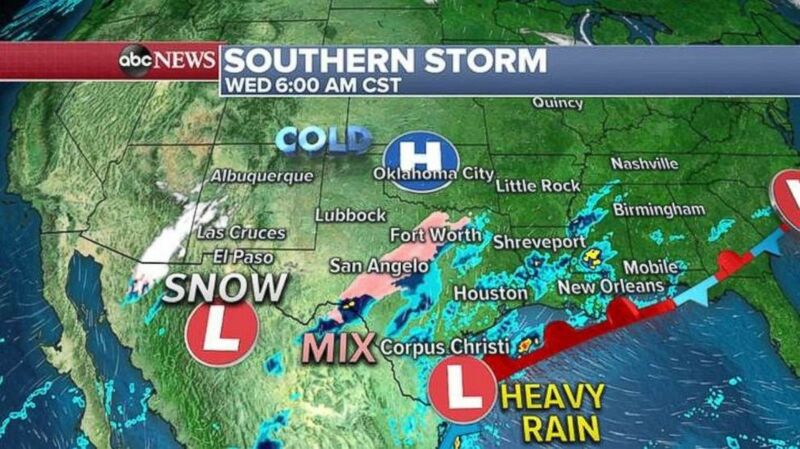 Rain is falling in eastern Texas while a rain and snow mix is likely farther west. By Thursday morning, as the systems merge, another round of heavy rain is possible across southeast Texas and much of Louisiana. Another round of snow and ice will move across central and western Texas. There is a possibility some of this precipitation will make its way into parts of Oklahoma on Thursday, including the greater Oklahoma City metro area. Heavy rain will move into the entire Gulf Coast region by Thursday. The storm finally organizes by Friday morning and starts sliding off to the east. Unfortunately, the storm will still bring another round of very heavy rain for parts of the Gulf Coast. Through Friday, 3 to 6 inches of rain are possible locally in parts of southeast Texas and much of Louisiana. Nearly 1 to 3 inches of rain are possible for the rest of the Gulf Coast from Texas to Georgia. Flash flooding will be a concern in this region for the next several days. 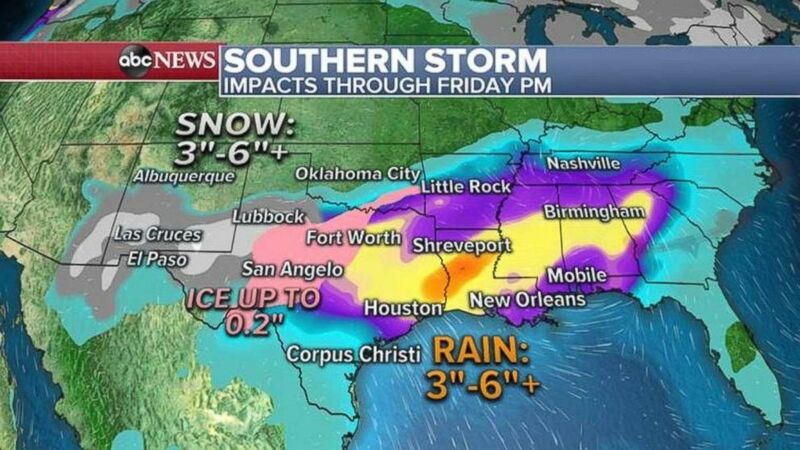 A few inches of snow are possible in western Texas and New Mexico, while 3 to 6 inches is possible across parts of the Gulf Coast through Friday night. The worst ice should stay west of Fort Worth and Austin, but some slick roads are possible in parts of I-35 metro areas where temperatures dip down to freezing overnight. As for snow, 3 to 6 inches are possible in parts of southern New Mexico to western Texas. It is unclear how much ice and snow will make its way into Oklahoma on Thursday. Accumulations of ice and snow in Oklahoma will ultimately depend on its ability to maintain colder temperatures as the storm tries to pull mild air northward. A quick-moving storm will slide down from Canada later Wednesday and quickly race across the Great Lakes and move into the Northeast by Wednesday evening. This type of winter storm, called a clipper, generally brings a quick burst of light snow. Some light snow will move into parts of the Northeast by Wednesday evening and last into the early hours of Thursday. 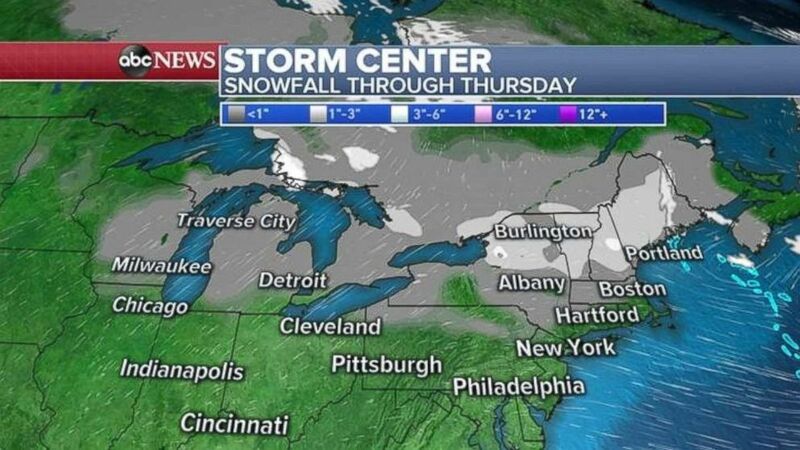 A clipper system could deliver a few inches of snow to parts of the interior Northeast on Thursday. This clipper narrowly misses an opportunity to combine with a developing disturbance in the Southeast and dump serious accumulation. However, there could be 1 to 2 of snow in parts of the Northeast through Thursday morning, with all likely accumulations north and west of the i-95 corridor from New York to Boston.